This property is located just a few miles outside of the village of Banwell which has a handful of shops places to eat and a castle. A short drive to the west of the property visitors will find the beaches of the Somerset coast including those at Weston-Super-Mare and Brean. Weston-Super-Mare is known for its expansive sandy beach where visitors can enjoy a donkey ride try their hand at water sports or simply relax on the sand. Also conveniently close at 18 miles away is the cosmopolitan city of Bristol which has something to interest everyone no matter what their tastes from a bustling nightlife to a science museum an aquarium a huge shopping centre and even a zoo. The rustic look to the exterior of this barn conversion property belies the sleek and contemporary design inside which is in evidence as soon as guests walk through the front door. The ground floor living space has two defined areas under the impressive double height ceiling which gives the whole place a spacious and airy feel. The lounge has a lovely cosy feel to it with its comfortable sofa seating and whitewashed walls. Alongside the usual TV/DVD here an iPod dock and an Xbox games console making this a great space to relax and have fun at the end of a day of sightseeing. The kitchen/diner is well-equipped with a table seating four an oven hob microwave fridge/freezer dishwasher and washer/dryer making it a pleasure to cook and prepare meals. A double room with its own TV is also located on the ground floor as is a shower room with shower and WC. 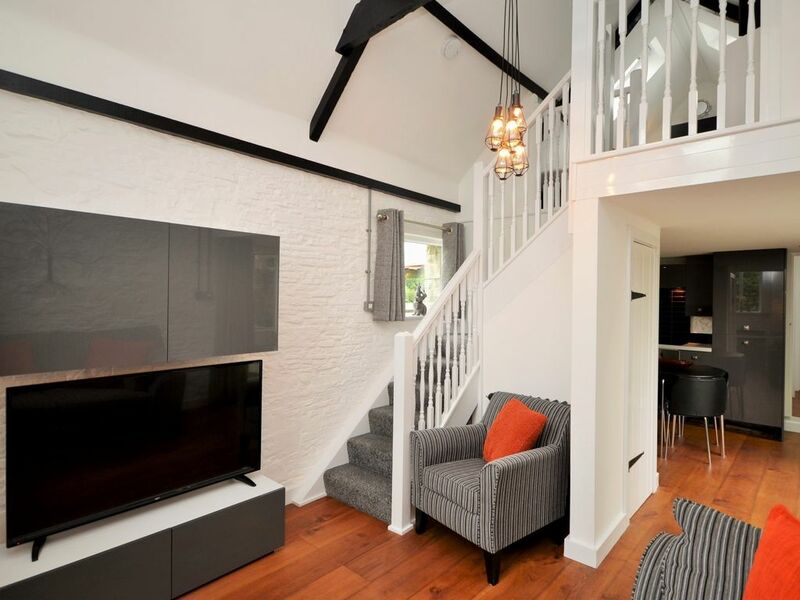 Stairs from the lounge area lead to the second bedroom which is a galleried twin room in the eaves of the house which also has its own TV - and is available for an extra 50pp per week. Please note the location of this bedroom in the roof space means that there is some reduced head height in this room. Outside there is a private enclosed garden for guests to enjoy which has been furnished with a table chairs and a BBQ making it an excellent space to sit back relax and enjoy the peaceful surroundings. There is ample off-road parking available.